We are configured for growth with prudent financial discipline and a strong balance sheet. Improved from cash outflow of $694m in FY 2015. There was no significant dilution as no major capital call has been made since 1997. Group net profit was $784 million for 2016, down 49% from $1,525 million for 2015. 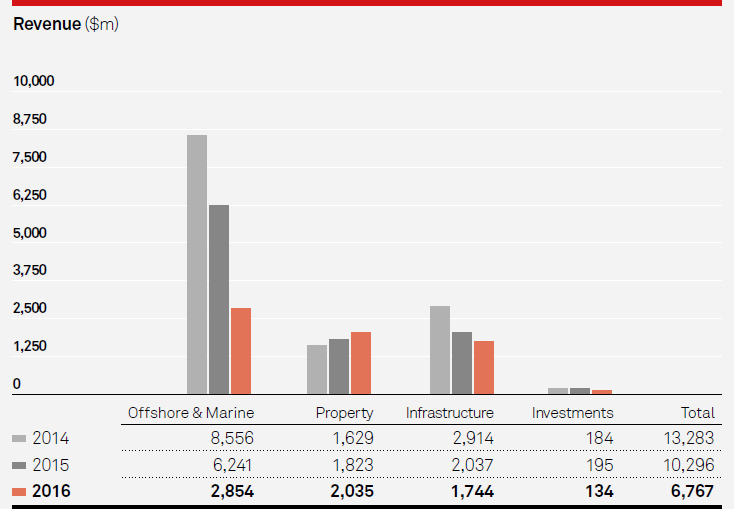 This was due largely to lower contributions from the Offshore & Marine (O&M) Division, additional provisions for impairment of $336 million, mainly arising from the rightsizing of Keppel Offshore & Marine and impairments of investments and stocks & work‑in‑progress. Earnings Per Share (EPS) was 43.2 cents for 2016, down 49% from 84.0 cents for 2015. Return on Equity (ROE) was 6.9%, compared to 14.2% in the previous year. Economic Value Added (EVA) was negative $140 million for 2016, compared to $648 million for 2015. In 2016, cash inflow was $576 million, compared to cash outflow of $694 million in the previous year. Meanwhile, net gearing for 2016 was 0.56 times. Total cash dividend for 2016 will be 20.0 cents per share. This comprises a proposed final cash dividend of 12.0 cents per share and the interim cash dividend of 8.0 cents per share distributed in the third quarter of 2016. Group revenue of $6,767 million was $3,529 million or 34% lower than that of the previous year. Revenue from the O&M Division of $2,854 million was 54% below the $6,241 million for 2015. This was due to lower volume of work, the deferment of some projects and the suspension of contracts with Sete Brasil. Major jobs completed in 2016 include four jackup rigs, a land rig, a derrick lay vessel, an accommodation semisubmersible and two Floating Production Storage Offloading (FPSO) vessel conversions. The Property Division saw its revenue increase by 12% to $2,035 million due mainly to higher revenue from Singapore and China. Revenue from the Infrastructure Division contracted by $293 million to $1,744 million, as a result of a drop in revenue recorded by the power and gas business due to lower prices and volume. Group net profit of $784 million for 2016 was $741 million or 49% lower than the previous year. Profit from the O&M Division of $29 million was $453 million lower than that of the previous year, due mainly to lower operating results arising from lower revenue and share of associated companies’ profits, as well as the impairment of assets. The negative variance was partially offset by the absence of the provision for losses for the Sete Brasil rigbuilding contracts of about $230 million in 2015. Net profit from the Property Division of $620 million fell by $41 million. 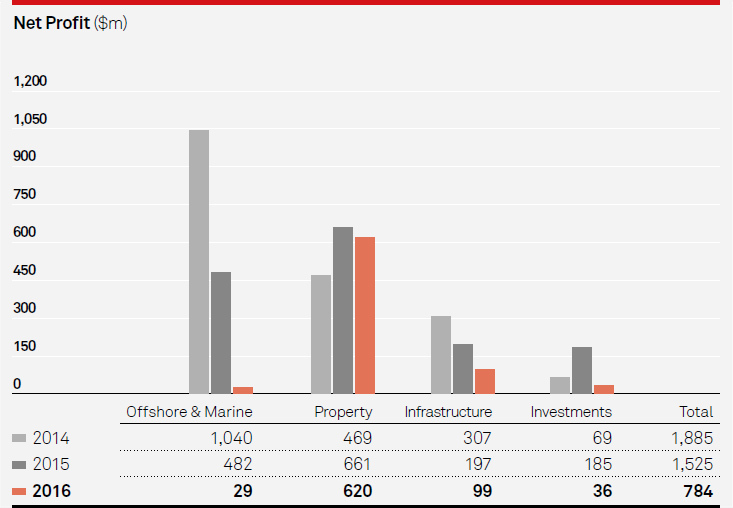 This was mainly due to lower fair value gains on investment properties, lower contributions from Singapore property trading, and share of associated companies’ profits and the absence of cost write‑back upon the finalisation of project cost for Reflections at Keppel Bay in 4Q 2015, partially offset by a reversal of impairment of hospitality assets. The lower share of associated companies’ profits was due mainly to lower share of fair value gains on investment properties, partly offset by the share of profits arising from the divestment of stakes in Life Hub @ Jinqiao in China and 77 King Street in Australia. Meanwhile, net profit from the Infrastructure Division of $99 million was $98 million lower, due largely to the absence of gains recognised in 2015. 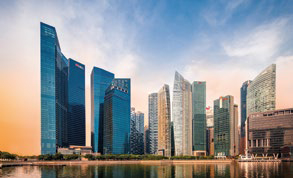 In 2015, there were gains from the disposal of the 51% interest in Keppel Merlimau Cogen Pte Ltd and the dilution re‑measurement of the combination of Crystal Trust and CitySpring Infrastructure Trust to form the enlarged Keppel Infrastructure Trust. These gains were partially offset by the losses following the finalisation of the cost to complete the Doha North Sewage Treatment Works. Profit from the Investments Division decreased by $149 million due mainly to share of losses and impairment losses of an associated company, and the absence of gains from sale of investments in 2015, partially offset by the share of profits from the Sino‑Singapore Tianjin Eco‑City. With a 79% share, the Property Division was the largest contributor to Group net profit in 2016. This was followed by the Infrastructure Division with 13% share, and the Investments Division and the O&M Division at 4% each. * Free cash flow excludes expansionary acquisitions & capex, and major divestments.